*Aging is frightening. When I go to the pantry and then can't remember why I'm there, or when I lose track of my deadlines... is it an early sign of dementia? *Aging is accompanied by aches and pains. Activities that once were effortless now require much more energy and cause my muscles and joints to "talk" to me in a louder voice than before. *Aging causes the creases in my face left after sleeping with my face buried in the pillow to hang around until midday. 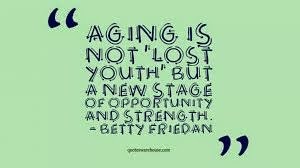 *Aging is an eye-opening experience. Each day brings something new which can be viewed as a hurdle or a gift. I choose "gift" because each new day, no matter your age, is a blessing. *Aging makes me realize how many wonderful experiences I've had and how much I've seen. Technology allows me to experience more even faster. *Aging gives me the wisdom to value the small things in life and to see the beauty in everything and everyone. *Aging means I'm still here living and loving and enjoying. It's a good thing. For me, aging means that the number of years I've been on the planet and the number I feel in my head are not the same. You see, in my head, I'm still 27...and that is the miracle of aging.